Most high, all powerful, all good Lord! All praise is yours, all glory, all honor, and all blessing. To you, alone, Most High, do they belong. Saint Francis of Assisi (c. 1182 – October 3 1226) was an Italian religious leader and Catholic mystic who founded the Order of Friars Minor, more commonly known as the Franciscans. He is known as the patron saint of animals, birds, and the environment. Though baptized as Giovanni Bernardone he was commonly known as Francesco. 2.1 Preach the gospel, and if necessary, use words. Be praised, my Lord, through all your creatures. Be praised, my Lord, through those who forgive for love of you; through those who endure sickness and trial. Let every man abide in the art or employment wherein he was called. And for their labor they may receive all necessary things, except money. ... Let none of the brothers, wherever he may be or whithersoever he may go, carry or receive money or coin in any manner, or cause it to be received, either for clothing, or for books, or as the price of any labor, or indeed for any reason, except on account of the manifest necessity of the sick brothers. For we ought not to have more use and esteem of money and coin than of stones. And the devil seeks to blind those who desire or value it more than stones. Let us therefore take care lest after having left all things we lose the kingdom of heaven for such a trifle. And if we should chance to find money in any place, let us no more regard it than the dust we tread under our feet. The Counsels of the Holy Father St. Francis, Admonition 27. Such was the will of the Father that his Son, blessed and glorious, whom he gave to us, and who was born for us, should by his own blood, sacrifice, and oblation, offer himself on the altar of the cross, not for himself, by whom "all things were made," but for our sins, leaving us an example that we should follow his steps. All those men and women … who in their body serve the world through the desires of the flesh, the concerns of the world and the cares of this life: They are held captive by the devil, whose children they are, and whose works they do. “Earlier Exhortation to the Brothers and Sisters of Penance,” Francis of Assisi: Early Documents, Volume 1, p. 43. We must not be wise and prudent according to the flesh, but, instead, we must be simple, humble and pure. “Later Admonition and Exhortation to the Brothers and Sisters of Penance,” Francis of Assisi: Early Documents, Volume 1, p. 48. As translated by Bill Barrett from the Umbrian text of the Assisi codex. Most high, all powerful, all good Lord! All praise is yours, all glory, all honor, and all blessing. To you, alone, Most High, do they belong. No mortal lips are worthy to pronounce your name. Praise be to God. Praise and bless my Lord, and give thanks, and serve him with great humility. Amen. Hail, queen wisdom! May the Lord save thee with thy sister holy pure simplicity! O Lady, holy poverty, may the Lord save thee with thy sister holy humility! O Lady, holy charity, may the Lord save thee with thy sister holy obedience! O all ye most holy virtues, may the Lord, from whom you proceed and come, save you! There is absolutely no man in the whole world who can possess one among you unless he first die. He who possesses one and does not offend the others, possesses all; and he who offends one, possesses none and offends all; and every one [of them] confounds vices and sins. Holy poverty confounds cupidity and avarice and the cares of this world. Holy charity confounds all diabolical and fleshly temptations and all fleshly fears. Holy obedience confounds all bodily and fleshly desires and keeps the body mortified to the obedience of the spirit and to the obedience of one's brother and makes a man subject to all the men of this world and not to men alone, but also to all beasts and wild animals, so that they may do with him whatsoever they will, in so far as it may be granted to them from above by the Lord. Such expressions are widely attributed to Francis, but no published source has yet been located prior to the early 1990s. Variants include those listed below. St. Francis reportedly said, "Preach Jesus, and if necessary use words." Witness for Christ each day, and if necessary use words. Conspiracy of Kindness : A Refreshing New Approach to Sharing the Love of Jesus With Others (1993) by Steve Sjogren, p. 120. Always remember to preach the gospel, and if necessary, use words. The Short-Term Missions Boom : A Guide to International and Domestic Involvement (1994) edited by Michael J. Anthony, p. 38. Wherever you go, preach the gospel, and if necessary, use words. What They Don't Always Teach You at a Christian College (1995) by Keith Anderson, p. 185. The Basics of Life (1998) by Andy Chrisman, Kirk Sullivan, Mark Harris and Marty Magehee. Go into all the world and preach the gospel, and, if necessary, use words. The Boomerang Mandate : Returning the Ministry to the People of God (1999) by Jim L. Wilson and Tom Stringfellow, p. 70. Do all you can to preach the gospel and if necessary use words! The Lord is my Shepherd (1999) by Alf Droy, p. 84. This Is Your Time : Make Every Moment Count (2000) by Michael Whitaker Smith and Gary Lee Thomas, p. 93. Preach the gospel always and if necessary, use words. ...love one another, as the Lord says: "This is My commandment, that you love one another, as I have loved you." And let them show their love by the works they do for each other, according as the Apostle says: "let us not love in word or in tongue, but in deed and in truth." Francis of Assisi, Rule of 1221, Rule 11 - That the Brothers ought not to speak or detract, but ought to love one another. ..."Yes, the true servant unceasingly rebukes the wicked, but he does it most of all by his conduct, but the truth that shines in his words, by the light of his example, by all the radiance of his life." (1989) The Road to Assisi, Sabatier as edted by Sweeney, pg 143. "No brother should preach contrary to the form and regulation of the holy Church nor unless he has been permitted by his minister. The minister should take care not to grant this permission to anyone indiscriminately. All the Friars, however, should preach by their deeds." Speak the Gospel, use deeds when necessary Mark Galli, Christianity Today, May 21, 2009. He is the author of "Francis of Assisi and His World"
Lord, grant me the strength to change the things I can, the serenity to deal with the things I cannot change, and the wisdom to know the difference. Widely known as The Serenity Prayer this has often been attributed to St. Francis, but earliest known forms of it appeared in the early 20th century, and it is generally credited to Reinhold Niebuhr. This quote was actually composed by Louis Nizer, and published in his book, Between You and Me (1948). Widely known as The Prayer of St. Francis, it is not found in Esser's authoritative collection of Francis's writings. Esser, OFM, ed., Fr. Kajetan (1978). Opuscula Sancti Patris Francisci Assisiensis. Rome: Grottaferrata. . Additionally there is no record of this prayer before the twentieth century. Armstrong, OFM, Fr. Regis J. (1982). Francis and Clare: The Complete Works. New York: Paulist Press. p. 10. ISBN 0-8091-2446-7. . Dr. Christian Renoux of the University of Orleans in France traces the origin of the prayer to an anonymous 1912 contributor to La Clochette, a publication of the Holy Mass League in Paris. 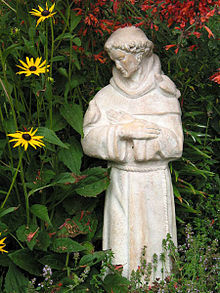 It was not until 1927 that it was attributed to St. Francis. Renoux, Christian. The Origin of the Peace Prayer of St. Francis. Retrieved on 2013-06-28..
Renoux, Christian (2001). La prière pour la paix attribuée à saint François: une énigme à résoudre. Paris: Editions franciscaines. ISBN 2-85020-096-4. .
Thomas of Celano, The Life of Saint Francis, Francis of Assisi: Early Documents, Volume 2, p. 293. I love the mystics; Francis also was in many aspects of his life, but I do not think I have the vocation and then we must understand the deep meaning of that word. The mystic manages to strip himself of action, of facts, objectives and even the pastoral mission and rises until he reaches communion with the Beatitudes. Brief moments but which fill an entire life. Pope Francis, who chose his papal name in honor of Francis, interviewed in "How the Church will change" by Eugenio Scalfari in La Repubblica (1 October 2013). He is great because he is everything. He is a man who wants to do things, wants to build, he founded an order and its rules, he is an itinerant and a missionary, a poet and a prophet, he is mystical. He found evil in himself and rooted it out. He loved nature, animals, the blade of grass on the lawn and the birds flying in the sky. But above all he loved people, children, old people, women. He is the most shining example of that agape we talked about earlier. Pope Francis, interviewed in "How the Church will change" by Eugenio Scalfari in La Repubblica (1 October 2013). Saint Francis is the outstanding exception to the rule that Catholicism discourages concern for the welfare of nonhuman beings. "If I could only be presented to the emperor," he is reported as saying, "I would pray him, for the love of God, and of me, to issue an edict prohibiting anyone from catching or imprisoning my sisters the larks, and ordering that all who have oxen or asses should at Christmas feed them particularly well." Many legends tell of his compassion, and the story of how he preached to the birds certainly seems to imply that the gap between them and humans was less than other Christians supposed. But a misleading impression of the views of Saint Francis may be gained if one looks only at his attitude to larks and the other animals. It was not only sentient creatures whom Saint Francis addressed as his sisters: the sun, the moon, wind, fire, all were brothers and sisters to him. His contemporaries described him as taking "inward and outward delight in almost every creature, and when he handled or looked at them his spirit seemed to be in heaven rather than on earth." This delight extended to water, rocks, flowers, and trees. This is a description of a person in a state of religious ecstasy, deeply moved by a feeling of oneness with all of nature. People from a variety of religious and mystical traditions appear to have had such experiences, and have expressed similar feelings of universal love. Seeing Francis in this light makes the breadth of his love and compassion more readily comprehensible. It also enables us to see how his love for all creatures could coexist with a theological position that was quite orthodox in its speciesism. Saint Francis affirmed that "every creature proclaims: 'God made me for your sake, O man!'" The sun itself, he thought, shines for man. These beliefs were part of a cosmology that he never questioned; the force of his love for all creation, however, was not to be bound by such considerations. While this kind of ecstatic universal love can be a wonderful source of compassion and goodness, the lack of rational reflection can also do much to counteract its beneficial consequences. If we love rocks, trees, plants, larks, and oxen equally, we may lose sight of the essential differences between them, most importantly, the differences in degree of sentience. We may then think that since we have to eat to survive, and since we cannot eat without killing something we love, it does not matter which we kill. Possibly it was for this reason that Saint Francis's love for birds and oxen appears not to have led him to cease eating them; and when he drew up the rules for the conduct of the friars in the order he founded, he gave no instruction that they were to abstain from meat, except on certain fast days. Peter Singer, Animal Liberation (1975), Chapter 5: "Man's Dominion... a short history of speciesism". St. Francis is not only the most attractive of all the Christian saints, he is the most attractive of Christians, admired by Buddhists, atheists, completely secular, modern people, Communists, to whom the figure of Christ himself is at best unattractive. Partly this is due to the sentimentalization of the legend of his life and that of his companions in the early days of the order. Many people today who put his statue in their gardens know nothing about him except that he preached a sermon to the birds, wrote a hymn to the sun, and called the donkey his brother. These bits of information are important because they are signs of a revolution of the sensibility — which incidentally was a metaphysical revolution of which certainly St. Francis himself was quite unaware. They stand for a mystical and emotional immediate realization of the unity of being, a notion foreign, in fact antagonistic, to the main Judeo-Christian tradition. Kenneth Rexroth, in "Eckhart, Brethren of the Free Spirit" from Communalism: From Its Origins to the Twentieth Century (1974), ch. 4. I saw St. Francis at first in his old age, at prayer and sickly, of an indescribable cheerfulness and purity and humility. Everything in him, everything that constituted his life, all his difficulties, are now transfigured and have become translucent. And this happened through prayer. The things that occupy him no longer contain anything at all that is purely personal, not a trace of annoyance or injury or resentment for the unjust things inflicted on him. God alone is left, as well as perfect service in the indescribable happiness of one who serves and in uninterrupted contemplation. Adrienne von Speyr, Francis of Assisi in Book of All Saints, translated by D.C. Schindler (San Francisco: Ignatius Press, 2008. ISBN 978-1-58617-192-6. This page was last edited on 13 April 2019, at 10:37.